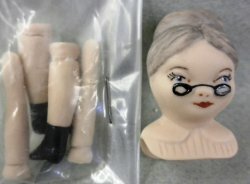 Isn't she sweet Porcelain shoulderhead doll with molded and painted glasses down on grandma's nose. She has molded and painted grey hair. Included are porcelain half arms and legs with painted shoes, and a pattern and instructions for making her body. Upper Corner Cabinet "Chef Julia"